In React application data and event handlers are passed down to children components through props. But sometimes you need to make some data available on several levels at once. Passing data through props manually can be cumbersome. To solve this problem react provides context api. 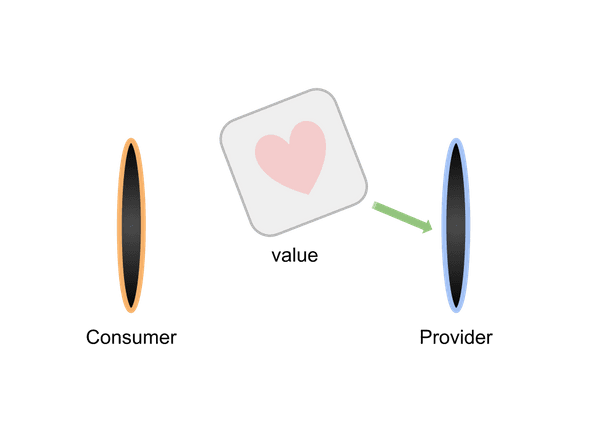 Simply speaking it’s two components Provider and Consumer. You pass data into Provider and then you can access it from the connected Consumer. We can use Consumer on any level of nesting. It will get data from it’s provider anywhere down the tree. One important note here that Consumer will only get data from the Provider it was created with. This will affect only consumer and only if it won’t have matching Provider anywhere above it in the tree. All consumers that are descendants of a Provider will re-render whenever the Provider’s value prop changes. In this example the first CounterView will update on every tick. Second one will always show the default value, because it doesn’t have corresponding Provider up in the tree. You can also pass functions through context. It is useful if you want to update Provider value from consumers. Here we created context and used destructuring assignment to create two variables Provider and AuthConsumer. To create variable AuthConsumer we renamed the original Consumer that we gon from React.createContextmethod. Then we defined a class AuthProvider that manages authorisation state. It wraps children in Provider and passes the loggedIn state and logIn function to this Provider. It is possible to use multiple contexts at once. It is required by React to keep each consumer a separate node in the tree. You should consider using React Context API when you have some data and maybe callbacks you need to share between multiple components, but you would have to pass them through layers of components that don’t need that data or callbacks.